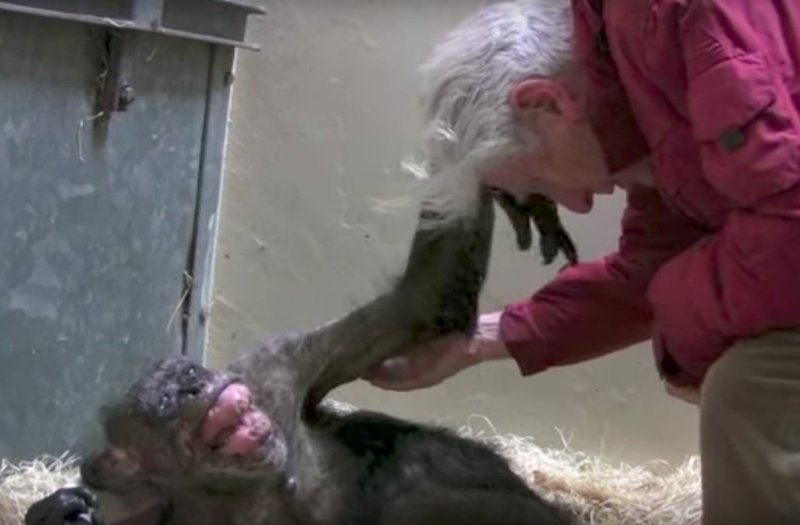 An ailing chimpanzee who refused to eat and could barely move somehow found the strength to let out a great big smile for an old human friend who paid her a visit. The touching 2016 footage, which is currently making the rounds again on social media, shows Mama, a terminally ill 59-year-old chimpanzee, lifelessly laying inside her enclosure at the Royal Burgers Zoo in Arnhem, a city in the Nederlands. However, a visit from Mama's old friend, Professor Jan van Hooff, who met her in 1972 while setting up the zoo's chimp colony, proved to be just the dose of medicine the sick animal needed. In the sweet clip, van Hooff approaches Mama and begins gently stroking her side. While at first Mama doesn't react to the professor's presence, the moment she realizes who he truly is her face lights up in the most heart-warming fashion. Sadly, Mama died about a week after the touching moment took place -- but her memory lives on in those who worked closely with her. "She had an exceptionally strong and dominant personality so that no man who wanted to come to power could do so around her," said Frans de Waal, a behavioral scientist who worked with Mama. "She also brought consolation when there were tensions and mediated conflicts." "She will be sorely missed, also by me, because I have rarely seen such an admirable character in both humans and apes."